This last Sunday I shared why Joy to the World is one of my favorite Christmas carols. In typical fashion, I didn't write it out and so stuttered and hemmed and hawed, struggling to articulate the words in my head. I love advent. I cherish the time of preparation, the solemn darkness of the weeks leading up to Christmas. I'm glad we don't skip over advent and rush straight into Christmas, missing all the nuances, all the reasons why Christmas is. We reflect on the peace, hope, joy, and light that Christmas will bring. And we long. Oh, how we long. O Come, O Come Emmanuel! It speaks to my heart, advent does. And this year advent has felt particularly important, relevant, needed. But it's also felt extra dark. The darkness that we live in both figuratively and literally is heavy and thick. We need no reminders. We are already longing for the light. But sometimes I long so much for peace and hope and light I forget about joy. How dare we dream of joy when peace and love and even basic kindness seem so far from reach? Joy is audacious. Joy is a luxury. How do we sing of joy in a world so broken? I feel comfortable in advent - ruminating, praying, hoping, expecting. I know how to live here, waiting for the light to come. I'm not so good at proclaiming that the light HAS come to a world still so dark. But at Christmas we rejoice! We are given a reason, THE reason to rejoice, and the joy is undeniable. We claim it. We proclaim it. We sing Joy to the World and we remember that there is joy - great joy and we rejoice. As we should. Joy to the World reminds me of my Grandpa, a most joy-filled man. I can hear him singing loudly, swinging his arms and holding the notes longer than everyone else for extra emphasis. Joy to the World reminds me of times spent singing Christmas carols around my mom's piano and it reminds me of a drive home from the mountains when Adam and I sang carols a cappella with my grandparents the whole way home. It reminds me of Grandpa leading the Christmas Eve service when he would visit our church in Calgary and how we'd end with candles and Silent Night. But as I remember it, Joy to the World was the real finale, the most fitting way to end a Christmas service. Because... JOY also, has the final word. I have a couple of friends who are expecting their first babies soon. One wrote to me asking for advice and opinions on baby gear and maternity clothes. This is what I wrote instead because this is what I have to say (barely edited, unpolished). She said it should be published so I'm posting it here. Maybe you need to hear the words, too. Pregnancy is super fun isn't it? I hope you let yourself feel EVERYTHING that you feel and don't listen to anyone's nonsense of how it's supposed to be. Don't let anyone make you feel like this pregnancy erases the pain of your last. Actually, don't listen to anyone at all. I loved being pregnant with Anna when I didn't hate it. Less so with Etta. And there's all the stress and worry and disappointment when you're trying and then the fear amplifies when you're finally pregnant and simply explodes when your baby is born. Through all the terrible parts of it: the illness, the loss of control and autonomy, the mourning of a closing of a chapter, and all the crazy hormones there is still this... a baby. And no matter what happens, just as it was the first time but surely with a happier ending this time, your life will be forever changed. And I would say that it's always hard and never easy but oh my goodness, so profoundly incredible. As far as pregnancy and baby advice I mean it when I say don't listen to anyone. Seriously. Other than this: don't be an a**hole - vaccinate your kids. Also, you need LESS stuff than you think. Way less. But most of all, in pregnancy, in motherhood, in all things - GRACE. Give yourself some grace. If you're like you'll feel like a huge screw up all the time and convinced you have ruined your kids forever. You'll look at these most beautiful, awe-inspiring creatures and think that you have taken all the good in them and tarnished it will all your terrible parenting and you will torture yourself with regret and good intentions. So try to remember the wise words of Glennon Doyle Melton and 'don't be so busy trying to raise a good kid that you forget you HAVE a good kid.' You will love your kid well so you have already won this war. Plus you have your husband and he's amazing. A husband who is truly your partner in this and a dad who will really be a parent. And you are strong - so strong and level, grounded. So remember that. Don't forget who you are. And there's this. I still tell Anna every night that I love her more than anyone has ever loved anything ever before. I know it's not true, but I feel like it is. And every time I say it I feel a bit heretical knowing a God whose love is so much greater than any I can comprehend. But I say it because caveats are confusing, but I remember that there IS that caveat and am grateful to my toes for it. I don't feel God's love the way I feel the all-consuming love for my kids and there is guilt with that for sure. But I'm learning and understanding God's love in an all new way. I never knew I could love something so much, and it just blows me away to fathom a love greater than this. And to share that with my kids, to have them feel secure and grounded in all this Love, well how incredible is that?! By extension I'm understanding how loved I am a little better, too. This is the bad news... the fear, the knowing better - that doesn't go away. And sadly for you, you know all too well the reasons we have to fear. And I don't know how things will be for you. I don't know if your loss will highlight your gratitude or shadow it, or more likely, both. But I know that being a parent is the most gut-wrenching, terrifying, disorienting experience I can imagine. And there is so much fear. I don't know how to cope with it other than living with it but I do know that the joy that is found in the present is stronger than the fear that lies in the future. Most of the time. Minute by minute, the little undeniable joys of parenthood make the fear and the uncertainty worth it somehow. It's only in letting myself feel the joy (and there is so much) that I am starting to combat the ever persistent fear. It's hard to do, wanting instead to to hedge against my fear so there isn't so much to lose (God forbid) but when I let myself enjoy all I have, oh my goodness, what joy there is. Learn to embrace the joy. So... I've answered none of your questions and rambled about nothing but for today that is what I have. I love you, I really do. You are one of the good ones. 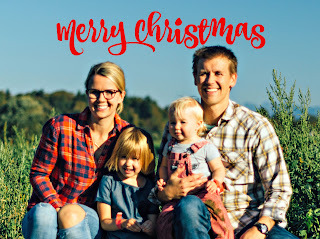 Merry Christmas from the Johnsons! Our 2015 was filled with love, laughter and a whole lot of fun. Anna (5) and Etta (1.5) bring us so much joy with their silly, sassy and sweet selves. We kept busy this year traveling to visit family and making memories of our own in our beloved Seattle. We're grateful for you and miss you. Please come visit! The other morning at breakfast Anna and I were reviewing safety drills: what to do if there is a fire, an earthquake, a gun. I had a stomach ache the whole time we were talking and she was crawling around on her knees, looking for a safe spot to wait out the imaginary earthquake. My anxiety is bad enough. I don't need help imagining all the horrific things that could happen to our daughters. I hate these conversations. I hate this reality. It's not my favorite conversation. I'd really rather skip it. But I didn't skip it. And the other mom thanked me for it. She's new to this country and she's terrified of the guns, too. She was glad to know that others asked. She wants to ask. These hard conversations may be the least we can do but at least they are something we can do. This all makes me so mad. I hate that we have to have these conversations. I'm furious this is our reality. And I'm so very, very angry at my inability to do anything about it. It's bad enough that the earth beneath us could start shaking at any moment and literally bring everything around us crumbling to the ground. But guns? Terrorists? Violence? She's going to Kindergarten next year and there she will learn what to do if someone comes into her classroom and starts shooting. They have to teach that now, just like stop, drop and roll. And she has to learn it because, oh God, because. I don't know how to keep her safe. I can't keep her safe. It's the most unfair and horrible part of parenting. It's enough to paralyze me. I don't know what to do other than have the hard conversations. I have something to say and if I don't say it now I worry I might never. Not necessarily well, and maybe never professionally. I will likely never get paid, and it doesn't really matter to me if others read my words. What matters to me is that I write. I wrote an email response to a friend today. I typed the words that were on my heart without edit or caveat. I let the words come naturally and fully. Not what I had planned on writing but what was truly on my heart. Just that simple act, an email, and my heart felt lighter, more settled because writing, as it turns out, is my catharsis. And there are so many reasons why I haven't written, and why I may not still. But for today, I write. I write because I want my girls to find their voices and to use them. I owe it to them to do the same. I write because I am learning to say 'yes'. Out of self preservation I default to 'no' but I have been discovering the freedom that can come in saying 'yes'. I write because in writing I make sense of my thoughts, my fears, my world. It connects me to myself, grounds me, calms me. It's the cheapest and most effective therapy I know. I write because I do it anyway, all the time. Even though I rarely get them down, I formulate my thoughts into words constantly: in the shower, at night when I lay awake, in the car while I'm driving. And I wish I had them all recorded, all those thoughts, because for me writing is my living archive - the best way I know to process and preserve what is important to me. I write to my girls privately, sharing with them as honestly and openly and without any reservation what my heart longs for them to know, what I fear I've failed to express, what I desperately need them to remember. God forbid something happens to me, the biggest gift I can leave my girls are my words because in reading my words they will know my heart. And my heart is really all I have to give. I write because of a few words of encouragement I've recently received. The kind of words that mean something from a voice that doesn't placate. Unsolicited, measured, premeditated, and heartfelt words that will give me life should I let them. Words that ought to be taken to heart. I write because that voice in my head that reminds me that there are millions of better writers out there so why should I bother is a lie. I write so that I may name that lie. I write to fight its power. I write because my voice might not be a great one, but it is uniquely mine. I write because life is short but it's never too late. And I write because of that fire in my bones, simmering always there under the surface. Because when I write I can feel the warmth of the flames. I'm changing Etta's diaper this morning kissing her belly, listening to her sweet coos, feeling her soft hands on my face, heart full and overflowing with gratitude and joy. And I can't help but think: it's only days now, really. Just days. It will be days until she's walking and crawling will be a thing of the past. The delight we get in watching her bum sway from side to side as she quickly scoots across the room will be no more. It'll be days too until she's using more and more 'real' words, less baby talk, less cooing. Days until she's fully toddler and not so much baby. One of these days she won't throw herself on the ground and roll around in ecstasies of delight and soon she'll stop crawling over to us just to give a hug, complete with a pat pat on the back. She might stop saying MUAH as she generously gives us 'almost' all the kisses we ask for. She might even stop giving us kisses. She might not nod her head in the same way, or say no so cutely and shake her head so violently that it makes us laugh for much longer. One of these days she won't giggle the same way and her buck tooth grin will give way to a smile full of teeth. Her perfectly plump legs will continue to thin out until what was 3 rolls becomes none at all. She'll find more words and stop using 'dis!' for everything she wants and 'mama' for everything she loves. She'll stop grinning and kissing everything and sticking her bottom lip out and crying when we say no. And I know, I know that there will be new things. New moments. New delights. Better ones even. But still. As we all know, it goes by SO fast. There are two gifts we should give our children: one is roots and the other is wings. Simple and impossible at the same time. One can't have both roots and wings! And yet that's what we do in this thing called parenting. This is what we try to equip them with. This is it. Really! Roots and wings. Roots that go deep so they know they are safe, secure, loved, accepted. Family and friends and community and traditions that allow their roots to grow deep and strong. So they know who they are, whose they are, where they belong. Roots that help them weather the storms that will come their way. Roots that give them strength and nourishment to grow tall. Roots that anchor them tight as year after year they stretch to the skies and grow. To reach for the sun - the light that nourishes. Roots? Yes, I want to give them roots. And wings. Wings to fly? Do I really want them to fly? Away from me and the relative safety I fool myself into thinking I provide? The answer is yes. A resounding and begrudging yes. I want to give them wings - their very own pair that will look nothing like mine. Wings that will take them where they want to go. Wings that will scare and excite with their speed and strength. Wings that will push their limits and open their horizons. Wings that will overwhelm with the thrill and promise of freedom. Wings that will let them explore and soar. Wings that will let them be who they are created to be. Wings that will let them live. Wings? Yes, I want to give them wings as much as I might be tempted to clip them. So Etta's learning to walk. She's in that stage where she can stand on her own and could take a step if she dared but she seems set on building her stability first. Practice, practice, practice. She's not sure she trusts her legs yet. She knows what she wants, but she's intent on the process right now. She's showing more restraint and patience than we have come to expect from her. She wants to walk, you can see the desperation in her eyes, but for now she wants to hold my hand. She wants the guidance and stability I give her, but the freedom her own feet provide. She stands on her own and holds position, huge grin on her face, looking around for applause, encouragement. And then back to crawling because it's what she knows. Little by little. Day by day. She's learning to walk. She's scared. She's excited. She wants to hold her Mama's hand. I'm scared. I'm excited. I don't ever want her to let go. She's learning to walk and all I can think about are roots and wings.